Provide comfort for the family of Wilma Gaddis Nix with a meaningful gesture of sympathy. 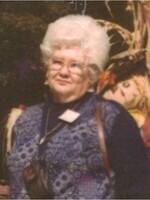 Wilma Gaddis Nix, age 80, of Cornelia, Georgia passed away on Saturday, March 23, 2019. Born in Gainesville, Georgia on October 11, 1938, she was a daughter of the late Verdell Leonard & Braska Cora Garner Gaddis. Mrs. Nix was retired from Scovill Manufacturing with many years of service. She was a very spiritual woman who loved the Lord, her family, and friends. Mrs. Nix witnessed to others about the Lord every chance she got through her track ministry. In addition to her parents, she was preceded in death by her former husband, Henry “Buddy” Nix, Jr., daughter, Vickie Nix, granddaughter, Christy Nix, brothers, Larry Gaddis, Jerry Gaddis, & Donald Gaddis. Survivors include daughter, Patti Dance of Cleveland, GA; son & fiancé, Ray Dean Nix & Tammy Edge of Toccoa, GA; daughter & son-in-law, Lisa & Donnie Monday of Cleveland, GA; sisters, Kaye Purcell of Demorest, GA; Faye Smallwood of Homer, GA; brothers, Jack Gaddis of Demorest, GA; Mike Gaddis of Dahlonega, GA; grandchildren, Tony & Chelsey Thompson, Shawn Dance, David & Chantley Funk, Jonathan Funk, & Zackary Funk, great-grandchildren, Christopher Colucci, Finley Thompson, Calvin Thompson, Landon Broom, Noah Funk, Chance Funk, & Miles Funk. Funeral services are scheduled for 2:00 p.m. Tuesday, March 26, 2019 from the Chapel of McGahee-Griffin & Stewart Funeral Home with Rev. Chris York officiating. Interment will follow in the New Hope Baptist Church Cemetery. The family will receive friends at the funeral home from 6:00 p.m. until 8:00 p.m. on Monday. To send flowers in memory of Wilma Gaddis Nix, please visit our Heartfelt Sympathies Store. Consider providing a gift of comfort for the family of Wilma Gaddis Nix by sending flowers. We encourage you to share your most beloved memories of Wilma Gaddis here, so that the family and other loved ones can always see it. You can upload cherished photographs, or share your favorite stories, and can even comment on those shared by others. Provide comfort for the family of Wilma Gaddis Nix by sending flowers. Our best with deepest sympathies to the Gaddis and Nix families, from: Donald and Merle Grizzle.